I wasn't planning on going hiking today. The heavy rains yesterday combined with the flood watch for today had me thinking of doing other things. I woke up however, and saw that the forecast called for partly sunny skies with a temperature in the mid 30's. How could I not hike? If I choose a route where there would be no water crossings, I could still have good day outdoors. I decided to do a small hike to Round Mountain in the Dix Mountain Wilderness. 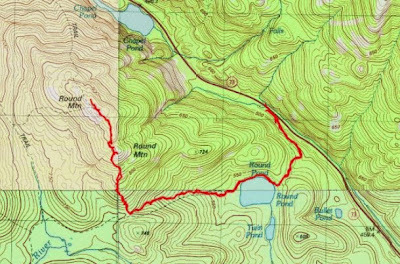 I would park at the Round Pond trailhead, hike the Dix trail to the height of land, then bushwhack to the summit of Round. I expected this to be a dry route and had heard the bushwhack to Round from the south yielded light woods and lots of open rock. I was on the trail at 8:30. The hardest part of this whole hike was the first quarter mile. Ice flows were on the trail (this is common here), however the ice was soft, and a little slushy, so my microspikes gripped just fine. The was 38 degrees out. I quickly passed Round Pond and began the 600 foot climb to the height of land. Soon I saw 4 men coming down. They had climbed Dix the day before (in the rain), and had stayed at the Boquet lean-to overnight. They told me they almost got stranded, as they had a hard time finding a place to cross the Boquet on the way down, in order to get to the lean-to. There is no way I would have wanted to climb Dix in the rain on Saturday. I continued on, and reached to height of land at 1.7 miles from the trailhead. It had been an easy 45 minute walk to this point. My dog Rev and I turned to head north towards Round Mountain. We had bypassed the cliffs that appear earlier on our right. As we had heard, the bushwhacking was easy. There was nothing but a dusting of snow on the ground. Being off-trail now, there wasn't any ice on the forest floor beneath our feet. It didn't take long to reach open rock. There was some ice on the rock, but it was soft. From this point on, I took my time. I just wanted to enjoy the woods and the views. It was still mostly cloudy, but there were some interesting skies and I stopped frequently to try and capture the moment digitally. 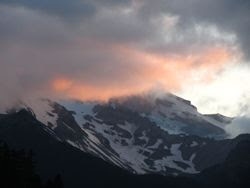 As you can see in the pictures below, the cloud formations provided an ever changing light. I snapped a lot of pictures in hopes that some would be keepers. There was a stiff breeze near the summit. We took shelter behind a rock to have some refreshments. It was still early. It had only taken 2 hours to get to the summit, even at our leisurely pace. Then I thought why spoil the relaxed pace. If I headed toward Noonmark, I'd have to deal with water crossings and possibly ice up high on Noonmark. I made the decision to just go back the way we came and watch for more changing views on the way down. It was a good plan. I continued to snap more pictures. I enjoyed this route. It was a great way to have a short combo hike/bushwhack to some amazing territory and great views.